Back in the start of the 20th century, a school of modern art and design was established in Germany. It had, as one of its underlying principles, form follows function. In other words, design an item where it is ideally made for the job it has to perform, not for its aesthetic form first. This doesn’t mean the resulting item does not have aesthetic merit, but it has to be designed to work first, before its form is considered. 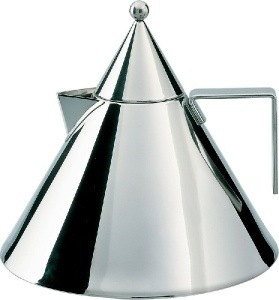 Many of the concepts that were developed are still seen today, such as this modern kettle, which is based on a Bauhaus design. The primary function of the kettle is to boil water on a stove. So maximising the surface area in contact with the element is first giving consideration to the function, before being concerned with the implication of that on the form. (And so on). It is a very appealing principle for engineers. Although we are 100 years on, many of the designers out there have seemingly forgotten that function is important, and so we have power tools that look like Cylons, tools designed to appeal to a particular demographic, tools designed for every reason, other than the specific function they are meant to perform. Tools built as cheaply as possible, because who in their right mind would actually want to pay good money for quality? This box warehouse concept, these Chinese-made tools, this concept of power tools for $10 and $20 have really destroyed many expectations of tools in a throw-away society. Buy a tool, use it for a few jobs, replace it when it dies. The service charges for repair of appliances is insane. As is the hourly rate that is proposed. More than many people earn as an hourly rate, so why would they spend 2 hours working to pay for 1 hour of a repairman, when for the same (or cheaper amount) you can buy a new, replacement (cheap) tool? So now we have over priced labour, over priced manufacturing, offset against ludicrously low priced imports. Never mind the imports are built, not for a function, but a price. Let’s not use real bearings, use nylon bushes. The tool is made to last 10 hours of operation for its life (and no, that is not an exaggeration, some GMC drills were specifically designed for 10 hours use. If one lasted longer, it was considered ‘over engineered’, and was rebranded platinum). 10 hours operation of a drill may last some households a lifetime, so sure, for some people, that is a reasonable purchase. But what I see when I look at those tools is a waste of resources. A waste of the raw materials that made them, as with the same raw product, refined better of course, and with a much better design, a real tool could have been made. In fact, the minerals would have been better just left in the ground, rather than mined, drilled, crushed, refined, shipped, refined more, shipped again, machined, assembled, shipped, distributed, and shipped again to be sold, in a product that cost $10, and is designed to last 10 hours. I tried to review a clamping workbench a few years ago. I won’t mention its name, but it was sold through Bunnings for a while. I had a couple of models to cover. The concept seemed reasonable, the sales video looked impressive. I got one model assembled, but the second broke before I even got it fully together. (I had videoed the whole process, and by the end, it was obvious that even if I did use the video, I’d have to over-dub the whole soundtrack). By the time I had the two assembled, the flimsiness of the material (too thin struts, too weak, too compromised to save a few dollars in raw materials), the overall quality of construction, both models were picked up taken back to the supplier and unceremoniously given back. I wanted nothing to do with them. (The company (importer) hasn’t spoken to me since either). All I could think was “what a waste of resources”. Not there was enough steel used to even make a good boat anchor from it. Perhaps if there had been, it wouldn’t have been such a crap product. About 6 months (or even less) later, Bunnings dumped the range as well. Guess that says something. So let me introduce a different concept. The Bauhaus of the 21st century. Instead of “Form Following Function”, I propose that the new Bauhaus is “Finance Following Function”. And one of the big proponents of this (not that I am suggesting they are considering themselves the new Bauhaus, that is just my take on things), comes from the country of the original Bauhaus, Germany. German engineering. It has long been regarded as the créme de la créme of design and manufacturing excellence, and when building something where Finance Follows Function, means building a tool to the absolute best it can be, to do the job it was intended to do, and then worry about the price. And there sits Festool. Tools made to be the best, not the cheapest. Other brands also appear: Tormek, SawStop, Woodpeckers, Incra, Teknatool. Tools overengineered, over-speced, over made, to achieve the optimum quality, not price. The tools last, and really work. “The bitterness of poor quality remains, long after the sweetness of a low price is forgotten” How true that is. I know expensive tools are, well, expensive. I know we can’t all afford the very best tools all the time. (Yes, I still have some GMC tools too). But little by little, I am replacing them with the quality equivalent. The first was my ROS (random orbital sander): when the previous one died, I bought my first Festool – the ETS 150/5. Sure, it was 3x the price of a reasonable ROS, but not once have I regretted that purchase. It is a pleasure each and every time I pick it up and use it. And my hands are not in real physical pain at the end of a sanding session either (from vibrations). I could repeat that same story for a number of other tools as well. So just something to keep in mind the next time you are shopping for a tool (or anything really). You may well be heavily influenced by price (who isn’t), but give some consideration to what I have said here too, and see if you can choose to allow “Finance to Follow Function”. You won’t regret the decision each and every single time you subsequently use the item purchased. It is a Bauhaus thing. Much of the evenings this week have involved short trips out to the shed for the next small step, primarily glue ups. Sure have gone through a bit of glue this project! 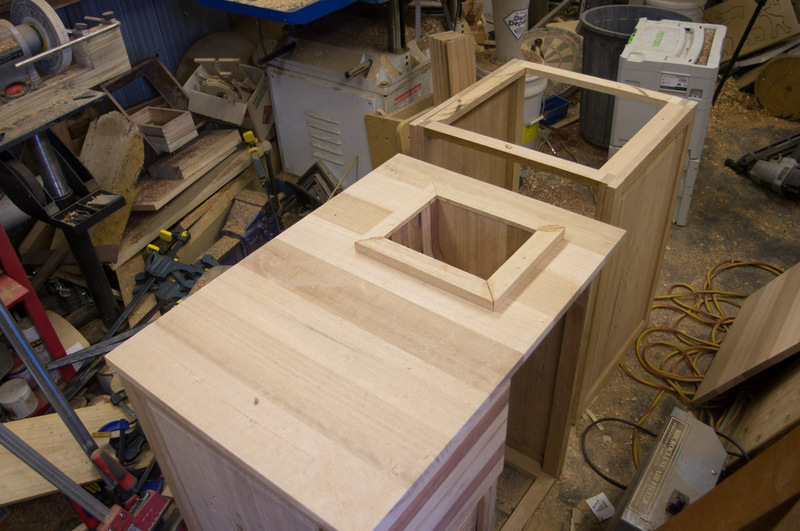 I cut the opening in the top of one unit for the sink using the Worx Sonicrafter. To stop the sink falling through (and add strength), I created a rebated mitred lip around the sink. I don’t have four corner clamps the same, so ended up using both the corner adapter on the Quick Grips for to corners, and the Woodpeckers Mitre Clamp Set for the other two. Interesting comparison – the Quick Grips were more convenient, the Woodpeckers did a better job. The design of it really allowed the corner to load up and get pulled together. I also made good use of the Woodpeckers Mitre square. 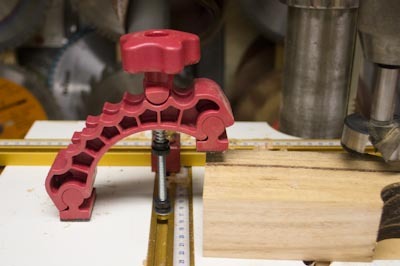 I can really see how having the Woodpeckers Mitre Clamp set mounted to a jig would give a very good result. 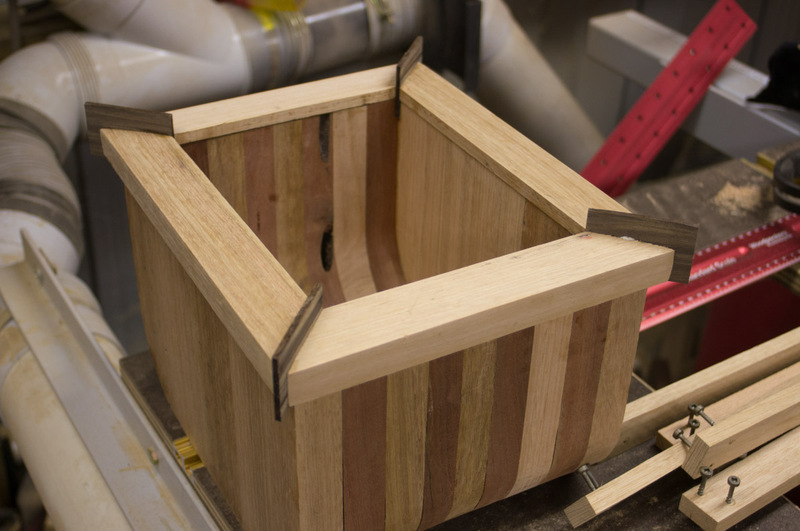 I wasn’t happy how the mitres went – not close enough for what I wanted. I’ve not had good results from mitre joints so far, and this one was no exception. Nothing wrong with the clamps, everything to do with my technique. So I decided to try another idea. I ran the sink back over the saw, with the blade carefully set to the height just to cut through the top, and created a kerf at each corner. Into that, I inserted and glued a piece of Solomons Queen Ebony. Once it is dry, I will sand it flush. Finally, before I ran out of time, I added some support to the front and rear edges of the trays – didn’t want to risk a split/breakage when loaded up and in operation. Still seems so much to do, progress is dragging. And Christmas is only a few days away! 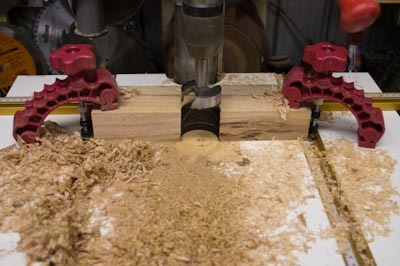 Being able to firmly secure a workpiece down significantly improves both accuracy and safety. 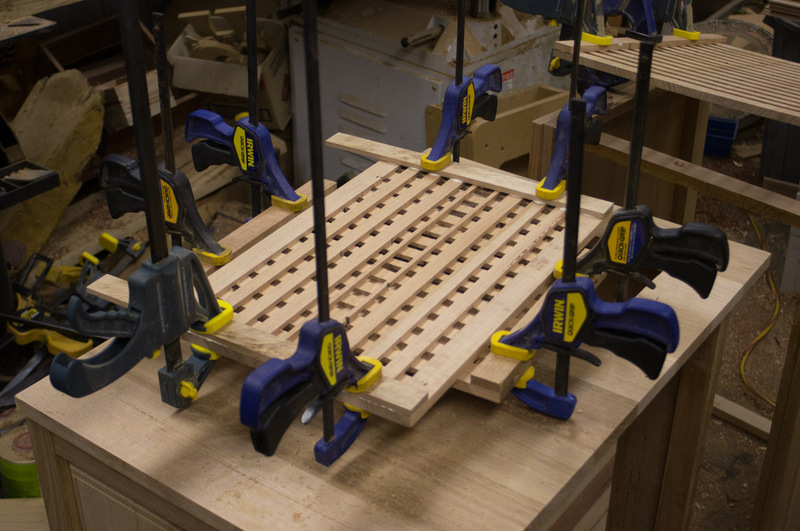 There are lots of different clamps on the market that engage with the working surface, and work with varying degrees of success. 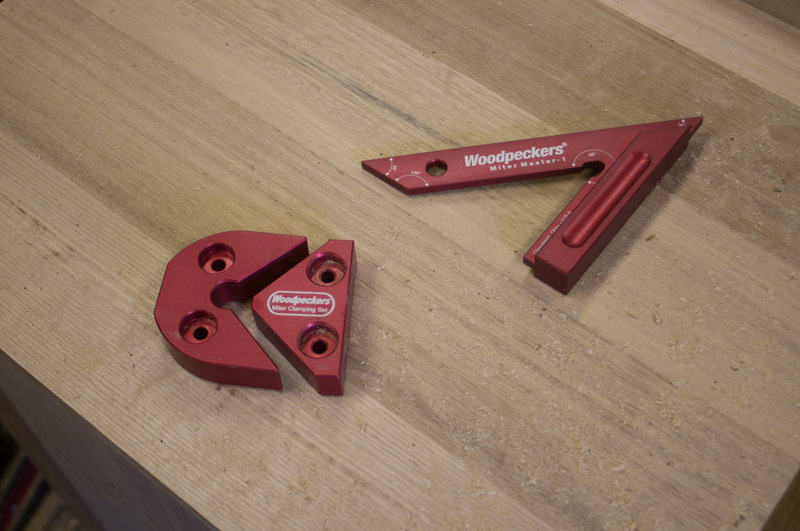 The knuckle clamp from Woodpeckers is an innovative approach (as is typical for them! ), using a reinforced polycarbonate body with seven pivot points to maximise the capacity of the clamp. Either end of the body is a pivoting foot to ensure the clamp makes maximum purchase on the working surface, and the workpiece. 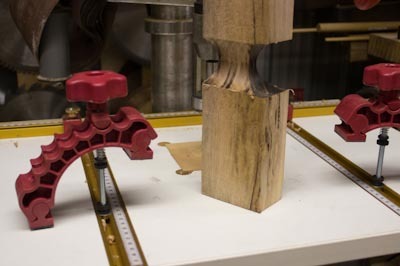 The clamp also utilises the Woodpeckers Multi-knob, which makes gripping the knob and tensioning it up easy. Not sure just how much load the clamp can take, bit it certainly provided more than enough for the test job here. They are said to be virtually indestructible, but I didn’t want to risk destroying the ones I had to prove the point! You can use Knuckle Clamps on all sorts of tools and jigs (homemade and otherwise) which have T track slots. 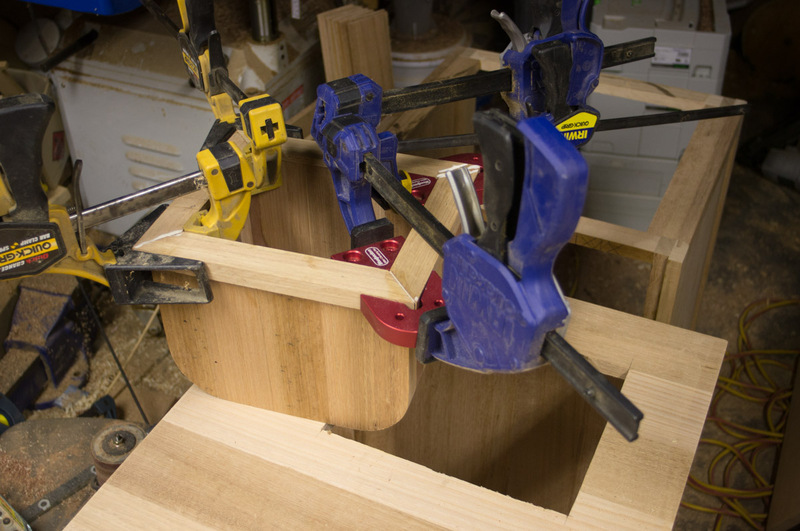 In this case I chose to use the clamps on the Pro Drill Press table from Professional Woodworkers Supplies. 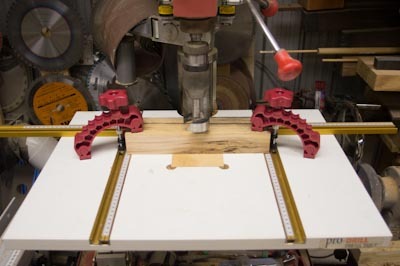 It would work equally as well on other items such as the router table, Incra Mitre Express, the T slots on a Torque Workcentre, and any homemade jigs that you have incorporated T slots. 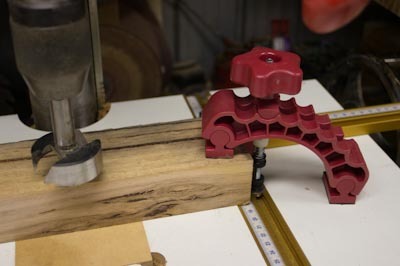 As a bit of a test for the clamps, I decided to try a partial-width drill with a forstner bit. Should prove a pretty good test of the hold capability of the clamp. Clamps held well, without any suggestion of a kickback. Didn’t know you could even do this with a forstner bit, especially when the central pin was not in contact with the work. Something you must not do with a forstner bit mounted in a handheld drill – the risk of a kickback is too great. 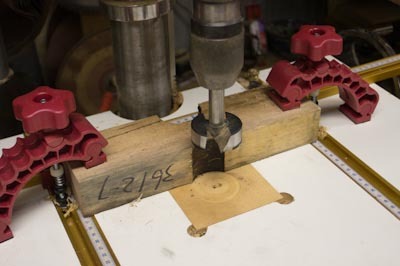 On the drill press this is achievable, but you must keep hands well away. The clamps can be preset, both in position along the track (and locked in position), and also preset for the degree of “opening”. This is via a second nut on the bolt which has a spring to hold the clamp up. This nut does not have to be moved while clamping down, so makes clamping, and reclamping work very easy. After the first cut, I tried a few more with equal success. So that is the knuckle clamp from Woodpeckers. 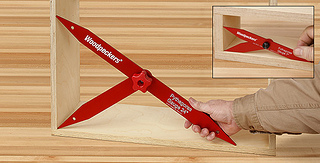 Sold in Australia through Professional Woodworkers Supplies. They also have kits which includes track to create some useful bench-clamping solutions. This is yet another interesting release from Woodpeckers. I call it “Knuckles”. It has 7 pivot points, maximising its versatility and ability to cope with varying stock thicknesses and shapes. Solving problems one design at a time, even before we are aware the problem needed solving! 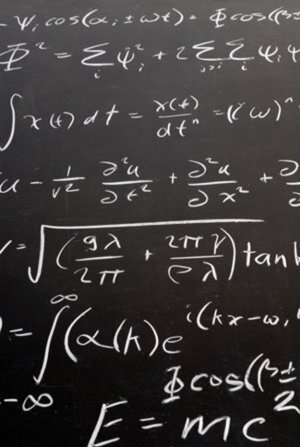 Formula. Our lives are defined by formula. The mathematical depiction of reality. So many of these derived so long ago, and yet still perfectly accurate. Nature defined. There is one that is again, so simple, so exact. a2 + b2 = c2 This one has only been around a short while….about 2500 years! 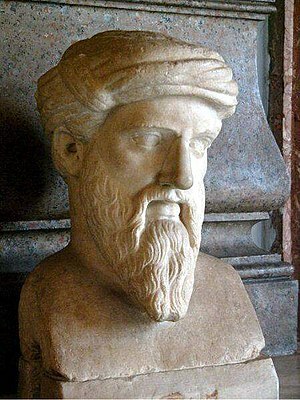 Known as the Pythagorean theorum, by the philosopher and mathematician Pythagoras of Samos. It is such a simple rule, a theorem in geometry that states that in a right-angled triangle the area of the square of the hypotenuse is equal to the sum of the areas of the squares of the other two sides. And the easiest version to remember is a 3-4-5 triangle. If your triangle follows this rule, you are guaranteed that the angle between the two shorter sides is a perfect right angle. So if this rule is so perfect for ensuring you have a right angle, then why not have a tool based on such a perfect formula? As a limited run (also known as “One-Time Tools”) from Woodpeckers, they have released a range of “Pythagoras Gauges“, available through Professional Woodworkers Supplies. The link takes you the set of all the sizes available as a set, but you can also purchase them individually, pricing ranging from $30 to $100. They are accurate (I don’t know to what degree, but Woodpeckers don’t work to coarse tolerances! ), and a lot cheaper than the equivalent square. The largest is around 1 metre (on the longest side): a square made to the same tolerances, to the same size would cost a fortune! Or be as (in)accurate as a carpenter’s square. The smallest is 178mm on the longest side, perfect for small boxes. They look unusual compared to a traditional square, but what is important is accuracy and functionality. If all three points are each touching a side (or corner), then the object is perfectly square. If not, then it is very easy to see not only which way the side needs to move to achieve ‘squareness’, but by how much. I see one improvement that could have been made: additional marks on either end of the long side would have been possible to demonstrate to a very fine amount how much off from square the object is. But other than that, a very interesting application of such an ancient theorum! 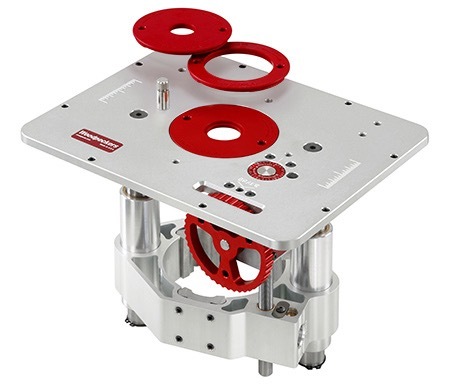 If anyone (in Oz) has a Woodpecker Unilift (the one that can mount a plunge router) that they are interested in selling, I have a club in Melbourne who would be very interested in talking with you. Apparently they are no longer available to purchase new which is rather disappointing (no longer being manufactured). 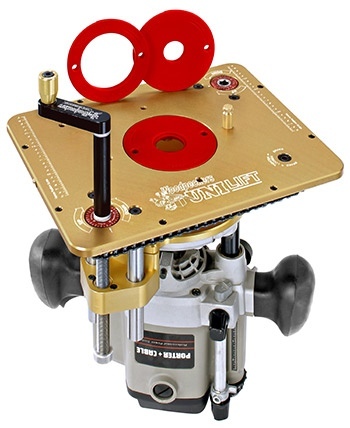 The US don’t use plunge routers as much, so the fixed router lifts are still common, and available but not the one that will fit a plunge router. Contact me if you have one available and I’ll pass your details on.